Amateur baking challenge. 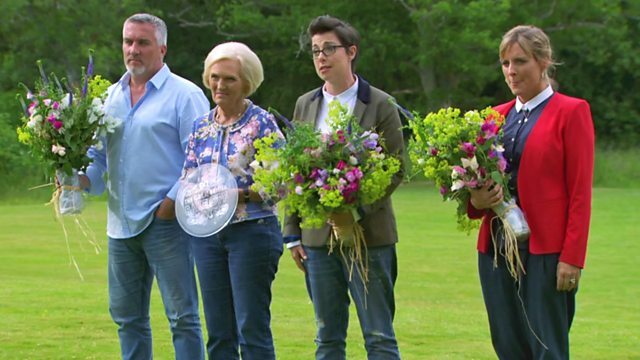 The three finalists face their last three challenges to discover who will be crowned winner of The Great British Bake Off 2015. Only three of the original twelve bakers remain. They've made it to the final. Over 27 challenges, they've worked their way through every baking discipline Mary and Paul have thrown at them - from cakes to bread, pastry to puddings, and biscuits to chocolate. Along the way they have tackled recipes from the 70s and 80s, they've gone back to the Victorian era, they've made gluten-free bread, strange meringue concoctions, incredible constructions out of biscuits, bread and choux... They have all survived, and now they face their last three challenges. The signature challenge sees the finalists tackle enriched dough to create delicious filled iced buns. The technical requires them to conquer something they have all struggled with, and finally, for their last ever showstopper, they must make a classic British cake. Mary and Paul expect nothing short of perfection. So who will hold their nerve? Who will be crowned winner of The Great British Bake Off 2015? On your marks, get set... bake! Find the recipes from this year's finals on the BBC Food website.